Bridgedoctor provides all you need to learn Bridge online using large clear graphics for clear display on any size screen. 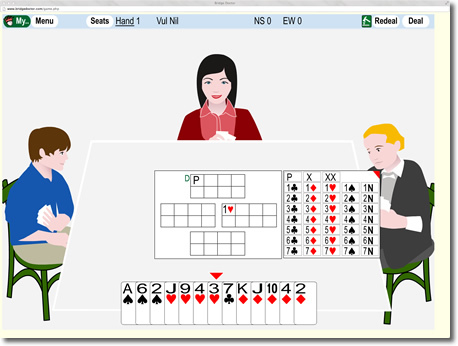 In addition to being able to play against other Bridge Players online, on Bridgedoctor you can also choose to play against the computer. This allows you to take your time to consider each play with no pressure from other players. Learn the basics, bidding, play and defence through a series of Interactive lessons and further lessons from top Bridge Players. Compete online against Bridge players from around the world. Use the forum to learn about bidding, playing and defence. 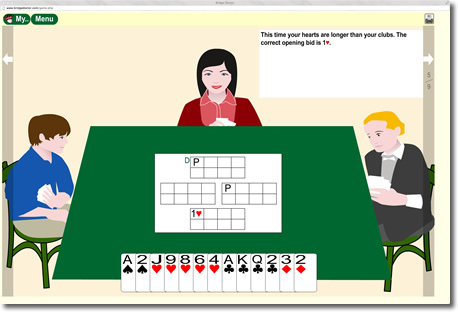 You can ask other members questions and even ask about a specific hand you have played.